Montana Offers A Boost To Native Language Immersion Programs Montana, home to nine Native American languages, becomes the second state to fund indigenous language immersion programs in public schools. The same languages were once forbidden in many schools. At Montana's Nkwusm Salish Language School, teacher Echo Brown works with a student learning Salish words. Luk means "wood" or "stick." Picct means "leaf" and solsi translates to "fire." Many Native Americans who attended a recent powwow in Missoula, Mont., remember what it was like to be punished for speaking a tribal language. For about a century, starting in the 1870s, the U.S. Bureau of Indian Affairs ran boarding schools for Native American children, removing them from their families and homes and separating them from their language and culture so they would "assimilate." Carrie Iron Shirt's father was one of those children. "My dad, being in the boarding school, they were taught not to talk their language," she says. Iron Shirt, 37, says her father still has bad memories of the treatment he received for speaking his native Blackfeet at school. "He didn't want us to go through that," she says. "So my generation missed out on the language." Iron Shirt tried to make up for that loss by enrolling her own daughter, Jade, in a private Blackfeet language immersion school. Now 16, Jade can speak the language fluently with her grandparents, something for which she's grateful. "You learn about your culture more," she says. "And that's what's more important, you know? 'Cause our culture is dying." Thanks to a new Montana state bill, expected to be signed into law this week, more Native American kids will have the same opportunity. 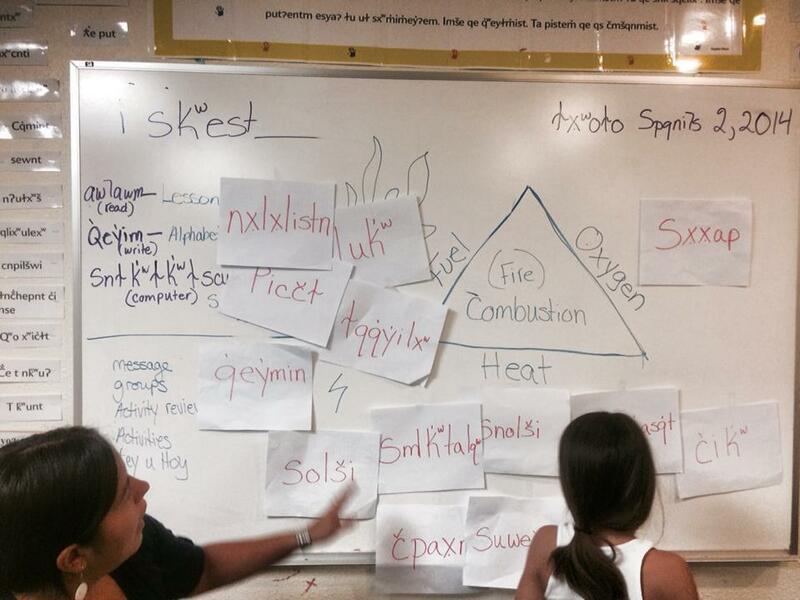 The bill subsidizes Native American language immersion programs in public schools. As tribes have reclaimed the right to educate their own children in recent years, native language instruction has been introduced in some Montana schools. But this is the first time the state will be supporting immersion programs — which provide instruction in an indigenous language for at least half the school day. April Charlo was first exposed to her tribe's Salish language in a seventh grade class. She's now the executive director of the Nkwusm Salish Language School serving preschool through eighth-grade students on the Flathead Reservation in northwestern Montana. For Charlo, immersion programs aren't just about preserving indigenous tongues. She believes they are also essential for closing the achievement gap — an important consideration in Montana, where the high school graduation rate for American Indian students is almost 20 percentage points lower than for students of any other race or ethnicity. "The language and culture and tradition and ceremonies, they're interlocked, they're interlinked. So when a child is learning their language, it just goes right to that connection." "The language and culture and tradition and ceremonies, they're interlocked, they're interlinked," Charlo says. "So when a child is learning their language, it just goes right to that connection." And that connection, Charlo emphasizes, is what helps kids succeed. "It's just a confidence ... 'I know my language, I know where I come from.' "
Under the bill, schools that are interested in creating immersion programs must apply to receive funding that will help compensate native language instructors. The only other state that provides funding for native language immersion in public schools is Hawaii, which has one native language. In Montana, there are nine. Jonathan Windy Boy, a Democratic state senator and a Chippewa Cree Indian, sponsored the immersion bill. "We're investing in a population of this state that has been neglected for too long," he says. "Investing in those human resources, I think ... is going to be the best investment that we can provide for all of Montana to be a better place to live in." The state legislature capped that investment at $22,500 total per year — half of what Windy Boy originally proposed and only enough to provide partial support to a handful of programs. But some of the bill's opponents, including Republican State Senator Roger Webb, think the cost of immersion programs should be borne exclusively by tribes. "I would rather see individuals, you know, learn Spanish or French or Chinese," Webb says. As for native language immersion, "If they really believe that that's an issue, it could be remedied on a home base." "The policies of the government ... helped almost eradicate the languages. So ... the state might as well put some money in to help bring it back." But Montana resident Roy Big Crane, a member of the Salish and Pend d'Oreille tribes, emphasizes that the state has a special responsibility to help revive native languages. "It was through the policies of the government, the states, Christianity, public school systems, that helped almost eradicate the languages," he says. "So that circle might as well come back and the state might as well put some money in to help bring it back."